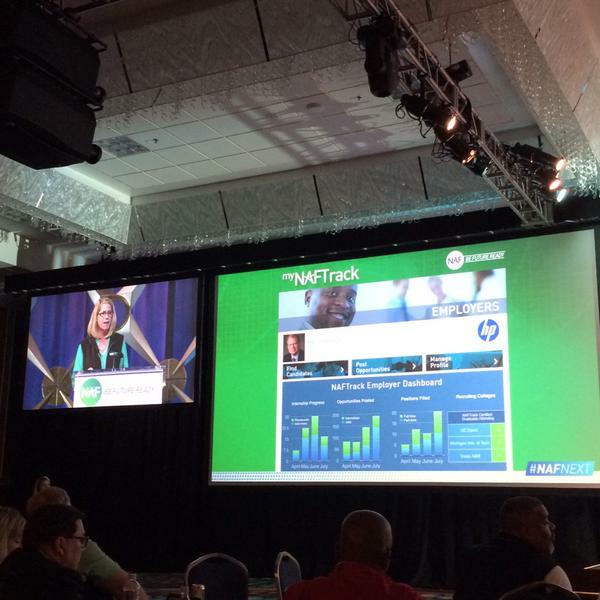 Brenda Berry, NAF Assistant Vice President, Academy Development, presenting the Employer's MyNAFTrack dashboard page at the 2015 #NAFNEXT conference in Anaheim, CA. NAF unveiled their MyNAFTrack program to great applaud in front of 1,500 people during their annual #NAFNext 2015 conference in Anaheim, California yesterday. VisionLink, a Boulder, Colorado based company, was in attendance and proud to be the chosen software vendor supporting the MyNAFTrack system. The mission of NAF is to sustain a national network of career academies to support the development of 81,000 NAF academy students across the country toward personal and professional success in high school, in higher education, and throughout their careers. NAF academies represent business and school partnerships that prepare young people for future careers through a combination of school-based curricula and work-based experiences. To better support these partnerships and overall career development, VisionLink has developed a unique and mobile-friendly software platform for NAF. MyNAFTrack, a cloud-based software, allows NAFTrack certified students to create student profiles online and track their career portfolio progress. In turn, NAF corporate participants can view these profiles and offer priority hiring to NAFTrack Certified students in an effort to better fill the country’s workforce pipeline with skilled and diverse talent.